Shortly after the social media campaign launch, a few responses/shares, notably Turning Point spokesperson Dominique Taegon. In the US ‘Turning Point’, funded to the tune of millions of dollars and with a significant social media presence, is known for listing academics considered hostile to right-wing students and ideology, and for support for Donald Trump during the 2016 president election. If successful, the duplication of this youth-focused programme in the UK could plausibly produce a palpable shift in the online dynamic. In other polities too the emergence of organised, well-funded networks of influence in social media might be of interest: in the UK, Australia, Canada, New Zealand political activity on social media platforms remains largely ad hoc with the exception of specific campaigns (for example the successful marriage equality campaign in Australia), and some concerted efforts to establish long-term networks by the Labor Party in Australia as well as Labour in the UK. The effect of US involvement is potentially significant in part due to the sheer scale of US social media relative to other polities (of particular impact in the ‘English-speaking world’), and the tendency not yet seen elsewhere for political movements to direct substantial funding towards establishing an ongoing, contrived presence. From my vantage, these factors make this launch event an interesting phenomenon to map using network visualisation tools (principally Gephi). 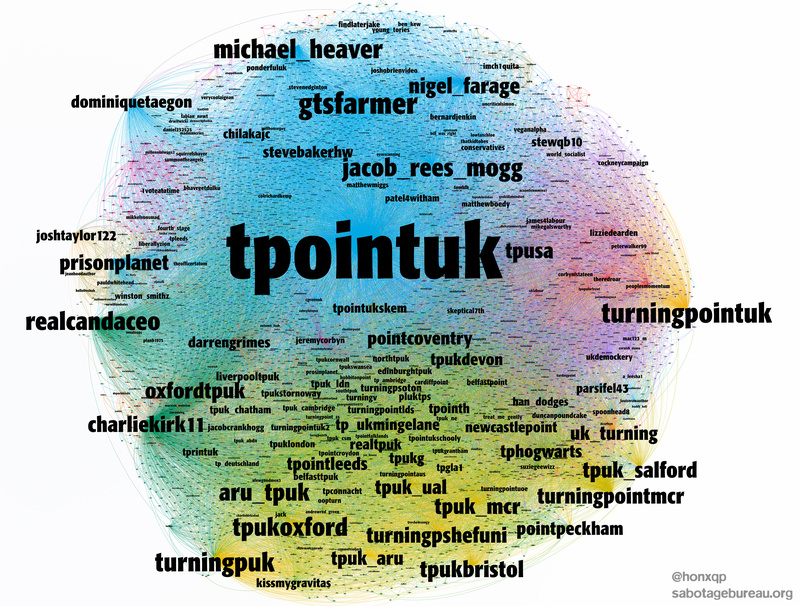 The following series of graphs represents the response to the Turning Point UK launch over a period of roughly four days – the data-set covers a period from the time of the initial tweet above until February 5th, and each image reflects accumulated responses at that time, with a period of 16-20 hours in-between. In all 45,000 tweets, replies, retweets, quotes and mentions were collected. 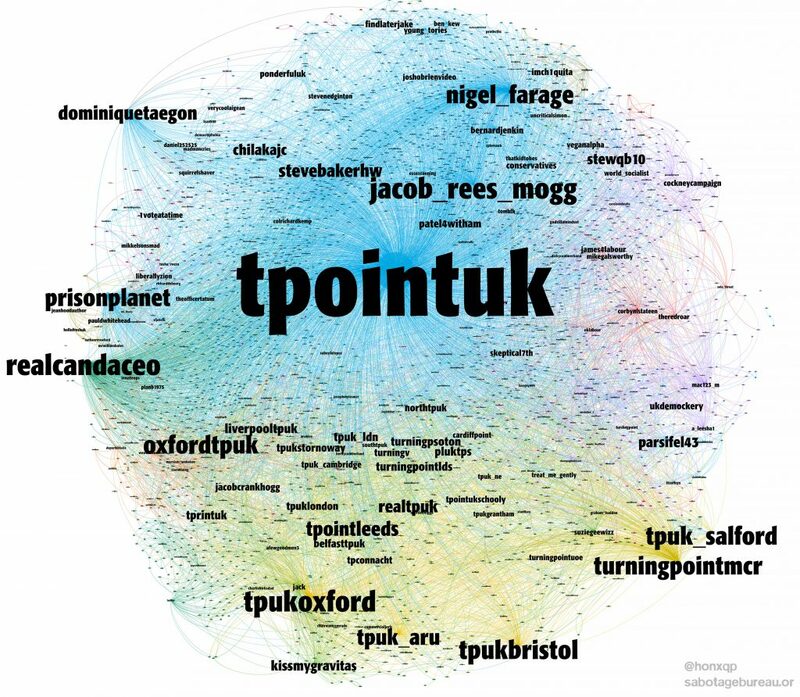 The map below represents the state of affairs the morning after Turning Point’s launch – a few thousand retweets, replies and mentions: significant accounts here belong predictably to prominent right-wing figures in the UK twittersphere. 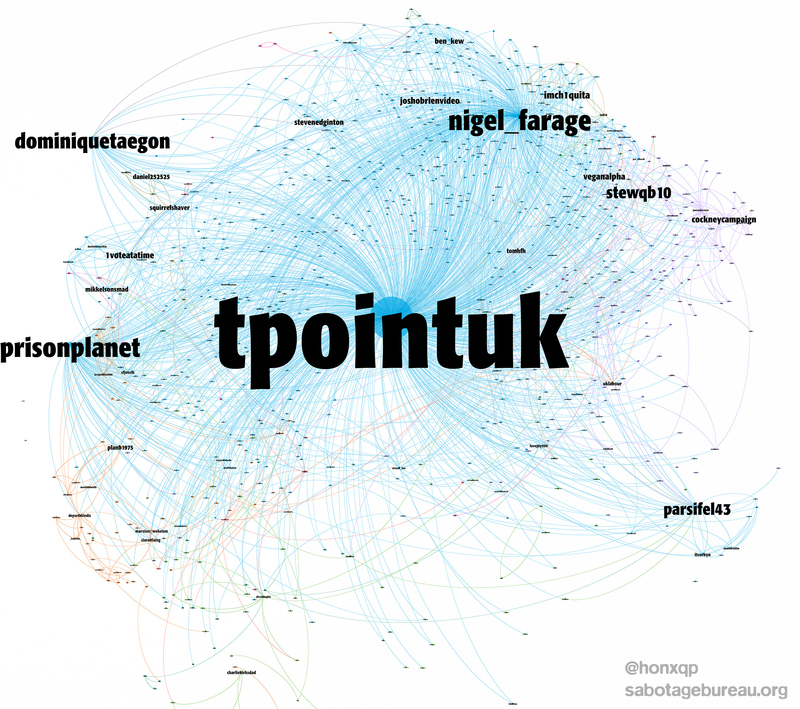 Sometime on February 2nd, though, the landscape changed with the appearance of additional accounts bearing the branding of Turning Point’s fledgling UK branch. 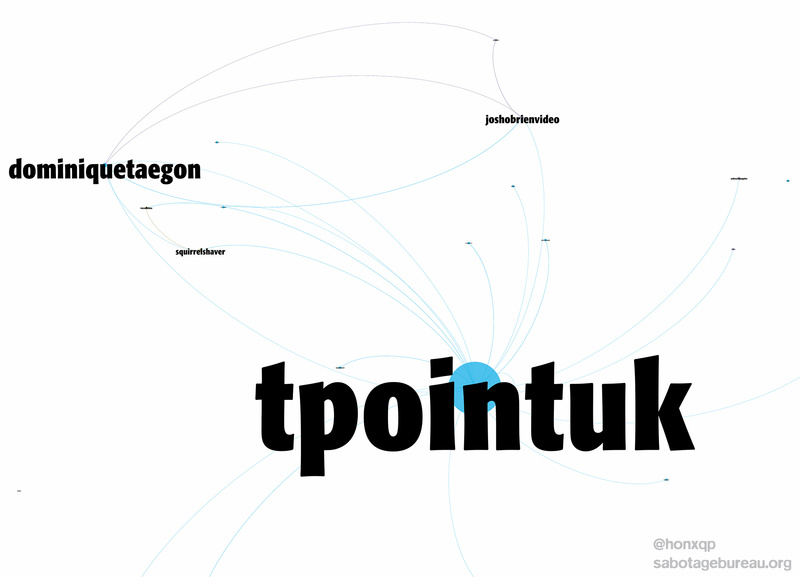 As can be seen below, the new turn escalated in the following hours and days – a handful of accounts vocal in support of the not-for-profit US import became a dozen, two dozen..they bear the ‘TPUK’ name, or some variant of it, and most have appended a regional tag. By the time I started scraping data from the previous five days, around a hundred accounts (by my estimate) were espousing the Turning Point message. Ostensibly. Meantime, the first account was receiving support, including from Tory MPs, and opprobrium in roughly equal measure. This sort of expansion of the social media network obviously makes sense in the context of a campaign that has promised a roll-out on campuses around the UK. But there was more going on. Wired describes the newer accounts as ‘an army of farcical fakes‘ that ruined the clean start Turning Point was hoping for in its outing in Britain. Madeline Grant in The Telegraph, meantime, wrote conversely that sabotage of Turning Point UK ‘rather proves’ the Tory youth group’s complaints. The BBC rapidly (and some might say predictably) invited a Turning Point spokesperson on to make their case on what ails modern universities, as they perceive things, under the auspices of the Left. But it’s early on in the project to transplant this American movement into a quite different body politic, we’ve yet to see how having been so thoroughly lampooned at its inception plays in to efforts to advance the right. 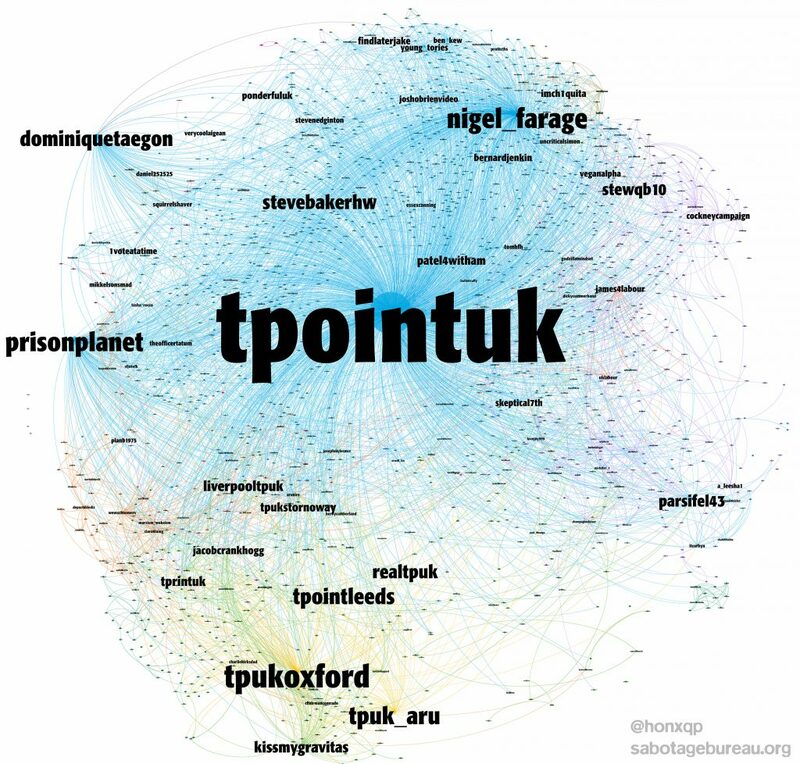 (To illustrate the tenor of campaign and counter-campaign I’ll post in coming days the complement to the graphs above – a semantic co-occurrence map of the most prominent terms employed, and a second map representing the tweets that garnered the most attention).